One early October morning “certain parents” made the mistake of telling their teen that “Ha, ha, ha, the truth is we don’t know what we are doing!” as they dropped him off for an over night camping trip. Don’t do that. Teenagers’ hormones are trouble enough, and they don’t need their parents sharing their existential crises – or at least displaying such a dark humor about it. They need their parents to make oatmeal chocolate chip cookies and smoothies and tell them everything is going to be okay. Early Fall of 2016 I waded into a midlife crises – I’m being dramatic, of course – and in such a dramatic state I started to fantasize about remaking the film, 8 1/2. From a female artist’s point of view. Whoa. Whoa. Whoa. Back up. Midlife crises? Why now? Maybe because I had come off a summer where I did things I had previously been afraid to do. That always shakes things up, doesn’t it? I had fallen into a tiny acting role on a friend’s movie – an exhilarating experience. I had also started playing shows with k-blamo on which I do vocals. Another exhilarating experience. Oh, that golden chakra. And the turquoise one, for that matter! Fall meant “back to work”. Even though I had taught all summer, the boys going back to school meant it was time to buckle down in the studio. Buckle down? I didn’t want to buckle down. Like Guido in 8 1/2 I wanted to break out of that traffic-trapped car and float up, up, and away. Something had changed within me, and I needed to explore it further. In Federico Fellini’s 1963 black and white film, 8 1/2, the main character is an artist as well. He is film director, Guido, just off one production and now being hounded to give his vision for his next film – a science fiction piece, no less. Guido starts out at some sort of healing spa, and ends up swimming in a sea of his own memories and dreams. Marcello Mastroianni, at the height of his cool style quotient, plays Guido. So, here I am. A female artist wandering the west side of Los Angeles that no movie crew is really looking for. No mistress is showing up – unless she is represented by social media distractions. Instead, my co-conspirator is patiently taking filming direction from me by the bus depot. The bus depot matches my skirt. Like Guido, the film director character in 8 1/2, I avoid my artistic project’s completion (in this case, a graphic novel that is so long it makes me want to cry) by wandering the city in a beautiful outfit and revisiting my entire life’s story. I even start my journey in my own spa – my childhood bathtub full of healing salts where I end up talking to my mother as if I was ten again, and to the moon outside the window – a window that is no longer there. Fellini talks to his dead parents in a sunny graveyard, suddenly dressed as a priest. Dream sequences, heavy symbols, Jungian imagery that 8 1/2 is known for? Check. Like Fellini, I need a note attached to the camera reminding me that this is a comedy – that life is a comedy. Eventually, Guido contemplates the idea of the “ideal woman” in an actress he wants to cast. I contemplate who I strive to be, as my own “ideal woman”. How did I get to deciding that a piece of Italian cinema so illustrated my crises? 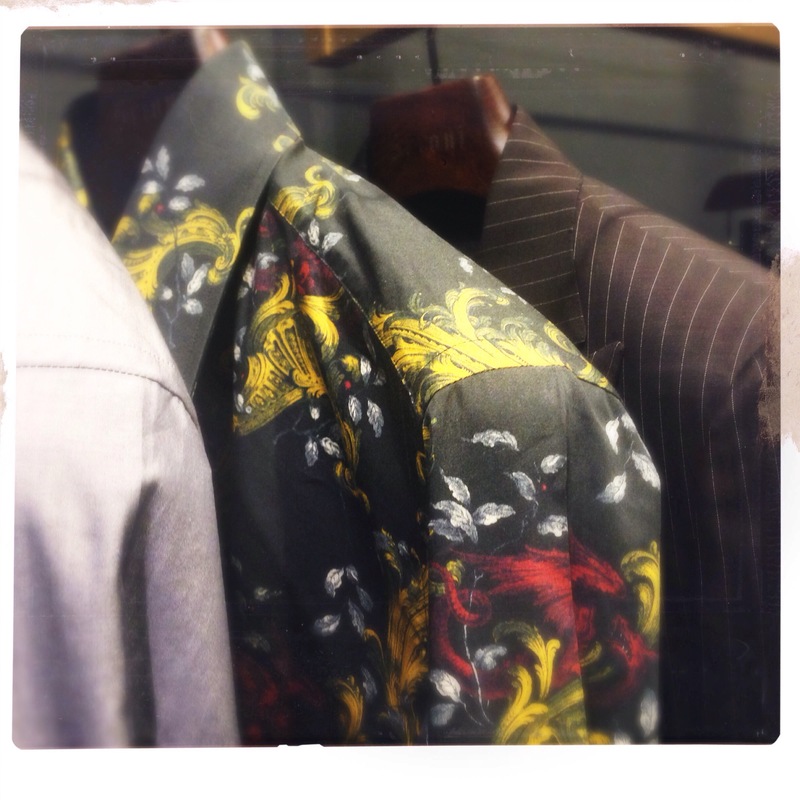 The seed was planted with a wander into an Italian menswear shop. One thing led to another, and through a series of cappuccinos, a visit from Tuscan friends, and on-the-street filming, I ended up at 8 1/2. I like portals, and the Brioni store in Beverly Hills is a portal to the elegant, gorgeous Italian bespoke shops of the 1940’s and 50’s. The Artist and I wandered into this epicenter of fine fabrics and spectacular stylings of fine men’s tailoring one lovely Fall afternoon. It was the red velvet that beckoned us initially. What is it about velvet suits that grabs us? It’s decadent, luxurious, and oh, so soft. It conjures up falcons, estates, and silver goblets. Three out of four people in my immediate family love velvet suits. My husband even contemplated a velvet suit for our wedding in 1993. One of my favorite moments from a trip to Florence, Italy in 1997 was taking a photo of a business man in a blue velvet suit, standing in a plaza chatting with his friends at lunch time. Casual. No big deal. I performed with a band in a velvet jumpsuit around the same time. 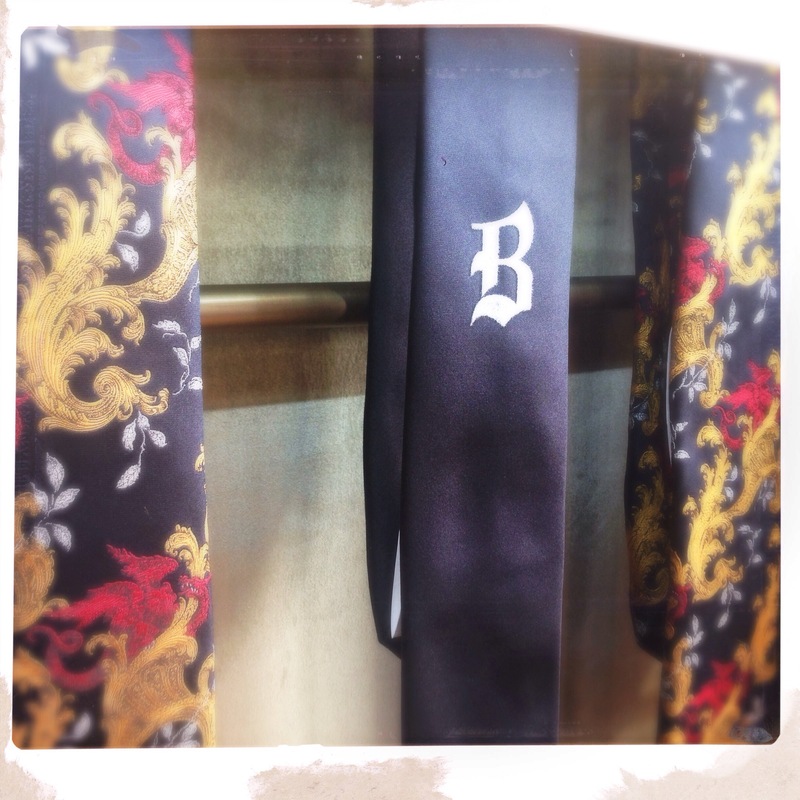 Now, The Artist wears a similar, red velvet jacket to the one in the top photo. Velvet is back. Once inside the store, the atmosphere was all mirrors, gold, and black. I felt like I was inside an Italian race car with bouquets of roses everywhere. We were greeted by Sheila, who because of our enthusiasm (and probably our outfits!) treated us like we were museum goers, and she was the knowledgeable docent. Clothing can be art to me, especially when they are so well made. Once Sheila told me about the attention and work that went into each suit, handmade in Italy, we bonded about the scene in Valentino, the Last Emperor that shows the handful of seamstresses making one of his incredible dresses. I love that scene – the intricate craftiness of it all. I grew up starting Saturday afternoons at the fabric store with my mom and then going home, each of us with a project at hand, cutting and sewing at the machine. Now, The Artist is pretty skilled himself, manipulating suit jackets with silver thread, vintage buttons, and yes, even adding Rushmore patches like you see on his jacket above. 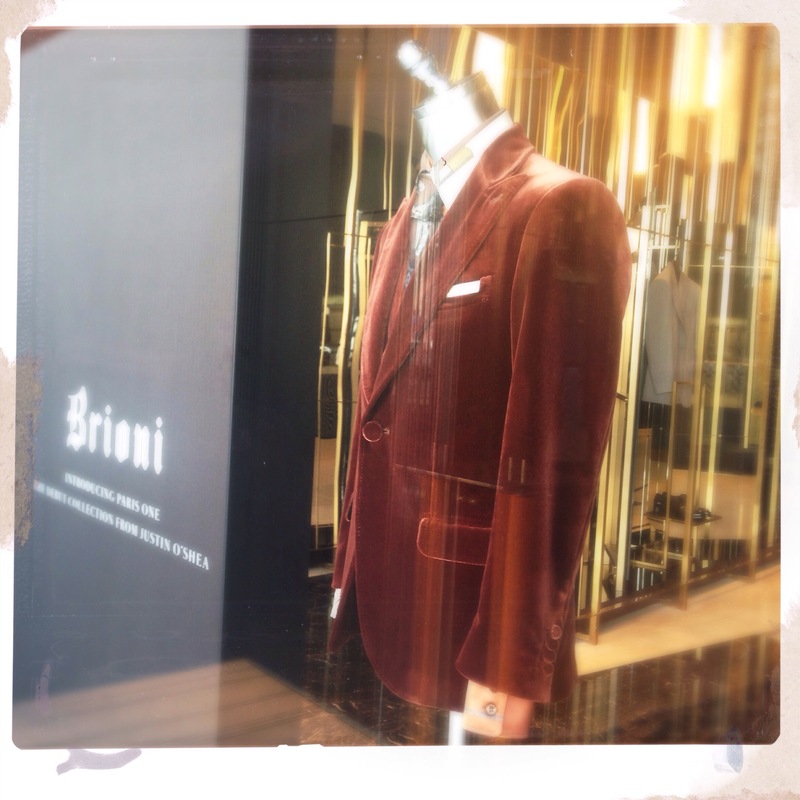 If the Fall was the filming of my 8 1/2, then Brioni was a trip to the wardrobe department. If there’s catering on this movie set, then for me it would be Caffe 8 1/2 in Santa Monica which I started getting into this past Fall as well. It’s kind of hidden, but oh so good. EVERYTHING is good here. I kind of went overboard on the sugar last time (Two words: Nutella. Pie. ), but I do not dissuade you from completely giving in to the whole experience. Any cafe that has a Fellini theme and a Marcello Mastroianni photo mural wins me over easy. Next time I am trying a panini, for sure. Getting ideas from Yelp at the moment where the reviews are all glowing. Wait, are these photos of my OUTFIT at Caffe 8 and a Half? Why, yes they are. The owner, Gaetano makes your visit to Caffé 8 1/2 even more special. On the Brioni website we see some red carpet photos of people wearing their suits, and one of them is of Chiara Mastroianni (French-Italian actress and singer) who is the daughter of Marcello Mastroianni (AND Catherine Deneuve… but that’s a whole other post. Wait, I already did that one). I don’t usually get stars in my eyes, but I swoon for the European art house cinema stars of my youth – my youth of seeing the films back in college, I mean. Marcello actually wears Brioni in this film. His look created a desire for a lighter suit, a more modern, on the go presence that reached all the way across the Atlantic. Lastly, there was Tuscany. I had one of those rare, sleepy afternoons this Fall where I curled up with a blanket and a self-indulgent movie. The “airplane” movie was something I found on Netflix called Under the Tuscan Sun. I’m not even going to talk about this movie in the same post as I mention Fellini – but, then again there is a whole character in this film who is obsessed with her past relationship with the great director. She even acts out a scene from one of his movies. Didn’t see that coming. I just wanted an escapist hour and a half, and I am back on set! Besides the always charismatic Diane Lane, the film’s other star is the location of Cortona in the Tuscan province of Arezzo. Now, here’s the crazy thing. Next thing you know, in the last days of October we were so happy to hook up with our friends visiting from Italy. He was originally one of our good British friends from our year in Leeds, UK. She was the wonderful Italian woman he met while camping in Spain, and lucky us, they brought along their six year old daughter who taught me a bit of Italian. And where do they live? In that same Tuscan province of Arezzo! A highlight of the visit was the little girl trying her first skateboard on the Venice boardwalk. They brought with them a bit of child like curiosity from the village which I so needed. Italy was everywhere, and it was guiding me through a Fall of transitions. I entered through a suit shop, took to the streets making a handful of haiku like music videos in support of a new EP, and was infused with fresh energy by our Italian visitors. The summer had already been a gateway to embracing my love of performance, as my partner and I performed music and spoken word at a couple of Los Angeles events (with plans for more!). Like Guido in 8 1/2, I realized a film crew was in fact following me. In this case, the crew turned out to be the world that constantly encourages me to produce, that promises to eat up whatever I make. So, I ordered a new business card… and splattered them all with hot pink acrylic. The circus-like ending to 8 1/2? Maybe that’s what 2017 needs. The artists, the dreamers, the lovers, the activated… dancing in the new year across what looks like a barren landscape, still hoping to make the world sing. This entry was posted in Art, Film, Kids, Make, Music, Travel, Uncategorized and tagged 8 1/2 film movie, Brioni, Caffe 8 1/2, Federico Fellini costume, female midlife crises, Italian cinema fashion, k-blamo, Marcello Mastroianni, the Last Emperor, Under a Tuscan Sun, Valentino, velvet suits on January 1, 2017 by Laura E. Alvarez.